Gnome 3.0 or Gnome shell has released few months ago, with a lot of new/exciting features and amazing experience. Gnome 3.0 claims to be the next generation desktop because of its innovative way the user interacts with the desktop. That’s why Gnome3 has been developed from scratched instead of just appending some features in existing versions (2.*). So there is nothing wrong in thinking that – Gnome 3 is just a preview of the next generation (upcoming) desktop (that you will notice in most of the Linux based Distributions) ; Fedora and OpenSuse is already using it in its new versions, while Gnome 3 can also be installed on Ubuntu 11.04 but the experience isn’t enjoyable with Ubuntu (because the PPA used for installing Gnome 3 is very unstable and often crashes Unity ..and eventually your desktop would become unusable). Fedora 15 (Code Named as Lovelock) was released a months ago with a lot of changes and surprises – Gnome 3 as the default desktop was the greatest one! Fedora is a free and open source Linux based operating system, and it’s the core of the most popular open source OS – Red Hat. Fedora strictly follow open source principles so it is considered as 100% free and open source Linux distro. A lot of good apps and large community supports are available. Fedora itself is a rock solid and stable operating system even though it has very high release frequency (similar to Ubuntu, but Ubuntu is very buggy and unstable as compared to Fedora). 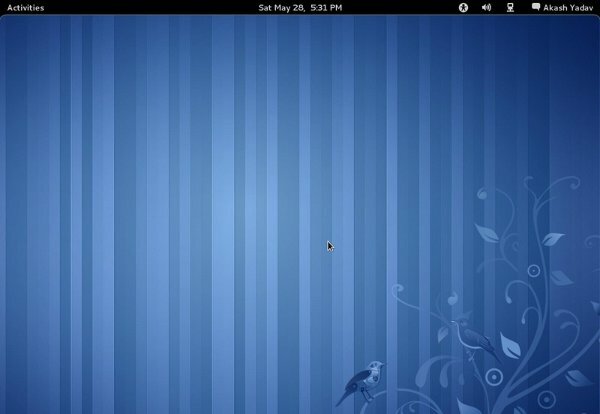 Fedora is often the most popular choice as a desktop OS among the enthusiastic GNU/Linux users (with some experience). Other Distro You may Try is OpenSuse although OpenSuse is more suitable in Office Environment but If can’t wait to try Gnome 3.0 and fedora seems a hard choice for you (I mean, you are an absolute GNU/Linux user) then better go with OpenSuse (latest version 11.4 has a lot of remarkable features and Fun!). UPDATE 1 : Ubuntu 11.10 is out now and Gnome 3 experience seems to be better with it .. if you may want to install Ubuntu 11.10 or install gnome 3 on Ubuntu 11.10 (if you’re already using it). Previous Postbest themes for ubuntu 11.04/10.10Next PostGoogle Voice Search – Available Now! for desktop users! what the heck are you talking about? Fedora is less buggy than ubuntu? Really? I’m used to running Ubuntu (way back in the 9.4 era. I’m running Fedora now, and it seems every single day I have to fix the repository stuff. It can’t just work no…. You have updates! official ones! but we can’t install them for you. Something went wrong, and our error messaging is only gonna tell you that the whole thing aborted since we couldn’t download the definitions for one package. Really? thats a fatal error? While I agree that Fedora is a great operating system and probably one of the best as concerns Gnome 3 inclusion, there seemed to be a lot of misinformation in this post. Ubuntu is the most popular Linux distribution for desktop users period. In addition I’ve used both Fedora and Ubuntu among many other distributions and I’ve usually found that Ubuntu bugs are less severe and fixed more quickly than Fedora bugs. Totally agree, although many Linux users simply eschew the command line, so for those Fedora would be a good option. At least with 15, which is the only release I’ve tried, it performs very well. Also, Aldabra (the GTK 2 theme that matches Adwaita) is included by default in their repositories. For the most part, Fedora is about as good as openSUSE. But nothing matches Arch’s ease of software management, nor its stability and level of control. Even for moderate users, Arch is quite nice, and it has its benefits. There’s nothing I couldn’t find in the AUR (except this one time, but I ended up adding it to the AUR moments later ^_~). Gnome is is very buggy in Ubuntu. The situation is better in Fedora but there is no way to install nvidia drivers. Very sad. I’ll wait for the next Suse to try Gnome again. i am running fedora 15 with gnome 3 with nvidia drivers and with flash 11 beta. google will find you everything you need. Ubuntu 11.10 does a brilliant job on Gnome 3, far faster than the standard desktop, (it cuts the boot time to a quarter of the unity boot time). Just for convenience in application launching I use Docky, a mac-like dock, but other than that it works great, and has more apps, than any linux with perhaps the exception of Debian, and Arch. Ubuntu is also very, very good on resources, unlike other linux distros.